Educated Trainers Stronger Cooperatives is a project coordinated by the Ankara Development Agency and founded by the Turkish National Agency under the Erasmus+ Strategic Partnership for Adult Education (KA2). On the occasion of the Raiffeisen Year 2018, many municipalities and cities in Germany have realised numerous great ideas to spread the life of the cooperative founding father and his thoughts into the world. One of these ideas originated in Weyerbusch itself, a small but decisive town for Raiffeisen’s path of life and his cooperative notions. Together, companies located in Weyerbusch as well as its citizens have launched the Raiffeisenliner. 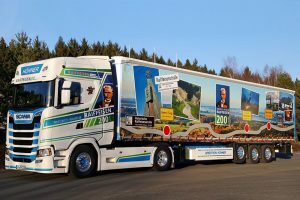 Under the heading “From the Westerwald into the World”, a truck belonging to a local transport company has been printed for matching the “200 years of Raiffeisen” celebrations and now travels across Germany. The Raiffeisen-Truck shows the “Historical path of life of Raiffeisen” as well as the stations of Raiffeisen during his lifetime. Of course, a special focus is placed on the town Weyerbusch itself, where Raiffeisen has been mayor and where he has developed his most important cooperative ideas. These cooperative messages and Raiffeisen’s career of the cooperative foundation is now visible on the roads of Germany and also online (https://raiffeisen2018.de/english). The Co-operative College’s Research and Projects Co-ordinator Amanda Benson joined the SUSY consortium’s visit to the EU Parliament last month. Read what she got up to below. 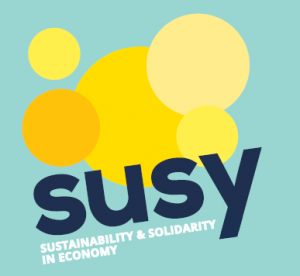 Last Tuesday was a very exciting day for the SUSY project as we got to sit in session with MEPs and use the consortium’s position paper to advocate for EU policy changes to create a more favourable legal and policy environment to support the growth of social and solidarity economy, or SSE (also referred to as the sustainable and solidarity economy). Having never been to the EU Parliament in Brussels, I was thrilled to get the opportunity to see inside where all the action happens, and it was not a disappointment. It was an incredible building, light and spacious with large atriums and plenty of modern artworks along with temporary exhibitions on the theme of the Holocaust and also the current refugee crisis. The SUSY session itself was in a debating hall and had several speakers advocating on behalf of the project consortium, the biggest ever funded through the EU. The president of COPSE, lead partners in the project, Giorgio Menchini opened the session with a round-up of the project’s achievements and underlined that the SSE is an important response to the biggest challenges of our times, namely climate change, inequality and the growing distance between the world’s richest and poorest people. He emphasised the fact that one of the great strengths of the project was its wide reach and that the research carried out by the project can demonstrate that the SSE is making a massive difference on the ground, with over 2 million SSE organisations across Europe employing some 11 million people. He pointed out that meeting the 2030 Sustainable Development Goals (SDGs) would be the ‘mother of all challenges’ unless radical changes were made to the way in which the economy operates, in fact he stated that they would be ‘doomed to failure’. Further, he argued that it’s not just adjustments, we need a ‘Copernican Revolution’, placing people, the environment and communities at the centre of the economy. The position paper itself has been a participative process including the priorities right across the SUSY consortium to make it more sustainable and remain relevant. As Marina Sarli, co-ordinator of the paper said, it’s not about a group of naive people dreaming of utopia, it’s a reality, and what’s really important is that the private sector is looking at supporting the SDGs as a key actor in respect of human rights and dignity. It was stressed that the SSE should not be pigeon-holed as a ‘sector’ – its values can reach out further across the private sector, as Jason Nardi from RIPESS stated, “The SSE is not a sector, it is a vector for change”. The EU is richer than ever, but more people are poor, so evidently something isn’t working and we need change. At present there’s no coherent EU framework to allow SSE initiatives to be created and thrive, and we need more training and education if we want new generations to think and act differently, acting co-operatively and not competitively. As Marina emphasised, “Business as usual is not possible, but unusual business is possible.” What is missing is thinking outside the box of the market economy, the mindset of addressing work and unemployment when global progress has changed the nature of work. It’s always about how we continue to grow juxtaposed with the contradiction that we want to include people, when in reality the market grows by excluding people, for example in increased automation. The presentation was attended by several MEPs who all expressed an interest in working towards the proposed changes, citing it as a key ongoing focus for the EU and necessary for addressing a whole range of issues around the environment, precarious working, social exclusion and migration. The one who struck the biggest chord with me was Elly Schlein who argued that if we don’t put enough resources and political will behind the SDGs, they may just remain on paper. She stated that with the current political shift to the right, it’s more important than ever as creating tension around immigration is used as an excuse to clamp down on international movement between countries. She pointed out that proposed changes to movement rules within Africa, as a means to prevent people moving towards the EU, are incredibly dangerous as movement between countries is fundamental to African economies, reducing opportunities for young Africans even further. She underlined that the rhetoric of the right revolves around the notion of creating an environment in African countries that enables people to stay in their home countries and find decent work and living conditions where they are. However, she pointed out that tax avoidance by EU companies in Africa was roughly equivalent to the Development aid budgets, so surely it makes sense for these companies to pay up this deficit of approximately $1 trillion, roughly equivalent to the current development aid budget. As Elly stated, it makes no sense to give with one hand and take away with the other! Last Thursday saw the launch of the new Co-operative Early Researchers Network. Amanda from the Co-operative College went along to see who’s involved and what they’re researching. Firstly, CERN is not to be confused with the institute in Switzerland where the Large Hadron Collider is housed. Having said that, it is aimed to create a ‘big bang’ by providing a unique space for early career co-operative researchers to come together in a mutually supportive environment to share research, discuss ideas, create joint working opportunities and be plugged into what’s happening in the wider co-operative research arena. As well as the Co-operative College’s Vice Principal Cilla Ross, who is co-supervising some of the students, the Co-operative College have the privilege of having Professor Tony Webster on board to support the network, informally mentor the researchers and help to build a vibrant and active co-operative early researcher community around all things co-operative. The launch was also an opportunity for staff at the College to meet some of the PhD researchers and hear about their research. Yaron Golan described the beginning of his research journey within the subject of The Making of Character: Education and the Formation of Character in the Nineteenth Century Co-operative Movement. He described how he has been examining the language used in the early writings of Robert Owen and its relationship to other writing at the same period, how the new understanding in the field of natural sciences influence the wider thinking and use of language in other writers. Cécile Beranger is beginning her research into Co-operative Placemaking and the Building of Co-operative (and social) Capital: A Case Study of Contemporary Rochdale. Cécile has been meeting with the Rochdale Local Authority and other important stakeholders in the borough as well as examining the history of co-operation in Rochdale. Temidayo Eseonu is investigating the ways in which local authorities, particularly co-operative councils, engage BAME communities to understand if there are greater opportunities to actively include minority voices through co-operative ways of working. These three researchers are in the very early stages of their research, and so are still exploring their subjects and trying to focus their investigation on a clear research trajectory. At the other end of the PhD pathway, Jo Darnley is in the final year of her PhD exploring The Visual and Material Culture of the Co-operative Movement 1844-2014, particularly examining the way in which are portrayed in historical co-operative movement publication Women’s Outlook. It can be a minefield at the beginning of a PhD when your subject appears to explode into a myriad of potential avenues of investigation, so I know the network will be a fantastic way for these early researchers to discuss their ideas and get advice and tips from their peers at all stages of their co-operative research careers. Andrea from the Co-operative College has written a great blog all about her recent visit to Rwanda and the difference our training will make to the lives of the individuals and communities involved. I have just returned for a week long scoping visit to Southern Rwanda where I carried out a needs assessment. The Tearfund project titled “sustainable agriculture and economic development” will be working with 1,500 self-help groups. As an associate for the Cooperative College and delivery partner of Tearfund it is my role to develop training manuals in business and financial skills, value chains and cooperative governance in order to supports members of the self-help groups to start up their own micro businesses and collectively work their way out of poverty. During my time in Rwanda I meet with several groups who have already started out on their learning journeys and have been able to make significant differences to theirs and their families lives. One such person was Daniel. You can read his story below. We have been a Self Help Group since 2012. When we started we were very poor, we could only save 10p per week per member. Now we save 60p per week per member. Through training we have learnt to identify resources within ourselves, how to build relationships and how to save and lend money. Now each and every member has a cow. This is significant for Rwandans for many reasons, it represents security and fertility. We have food security as we can now have milk from the cows, and we now have fertile lands as we can fertilise our land with the cow manure. Before none of us could harvest 30kg of beans, now we grow 300kg. In addition to this my cow has given birth 4 times, so I have been able to sell the offspring. With the surplus produce we harvest we are able to sell this and earn some money. We have now all paid for health insurance (£3 per person per year) and 2 of the members who were landless have borrowed money to buy land. It is so motivating. We aim to become a cooperative. Through the training, which will be conducted over four and half years, we hope to help transform people’s lives in the same way as Daniels. Through their love to learn, we will equip them with the knowledge and skills to change their lives for the better. In part two of her blog series, Amanda from the Co-operative College looks at what solutions and suggestions came out of the launch event and how these can be put into practice to tackle the growing problem of young people feeling isolated and alone. It has already been know that Britain has been shown to fare less well than other wealthy countries in terms of happiness, based on a study carried out ten years ago, but this is not uniform across the country, as some areas were very positive about friendships and communities. The researchers emphasised that it is important to get the message across that loneliness exists and we need to talk about it without shame – it’s a real thing that’s painful, but it’s not the worst thing, it won’t go on forever and it can end. The reason why it’s so important to focus on young people is that this is very much a ‘first time’ nature of their experiences and they don’t know how to get through it, it may be the result of a transitional moment of their lives where they feel that they ‘can’t keep running to mummy and daddy’ feeling that society pushes you to stand on your own two feet. The whole idea of calling the report ‘loneliness connects us’ is acknowledging that it exists and that everybody will experience it at some point in their lives. It also encourages us to look at how young people deal with a rupture in their lives and the idea that loneliness can spread through communities. It has been proven that loneliness can have a physical effect on people, narrowing perception and decreasing serotonin that can be self-perpetuating. Another issue identified was that of social media ‘lurking’, where people are vicariously online in a world where you can compare yourself to everyone online where people often only post positive things. Social media can often be blamed as a culprit, but it is how we use social media and online space that is important. Online friendship and spaces can be really useful spaces for people to make connections. One of the key tools of the project was to use theatre as this demands participants to dig within themselves. It takes the common themes from all of the young people’s experiences and turns it into something young people can relate to. Switching between performance and discussion to give different perspectives of loneliness and intimate relationships. In this way young people were brought together to take part in an immersive and interactive performance piece, ‘Missing’. Participants take on the role of trainee police officers who are presented with evidence about a missing teenager through film and actors. This approach was used as it is so hard to talk about loneliness, but by using this technique young people are encouraged to investigate the multiple aspects of loneliness in a supported and guided simulation that provides a ‘safe’ space to tackle the issues. The second section of the day gave everyone the opportunity to take part in presentations from a range of youth projects. My first conversation was with Fresh R&B, a social enterprise based in Miles Platting that runs video production workshops and produces films purposefully designed to bridge research with engagement & reduce loneliness. I then had an interesting discussion with the Barnardo’s leaving care project, a peer-led support group for people leaving care so that they can overcome issues such as isolation and push for changes to the support they receive from their local authority and housing organisations to make it easier for care leavers to become independent. I also spoke to Off the Record, a mental health social movement by and for young people aged 11-25 living in Bristol and South Gloucestershire and the Proud Trust, the Manchester-based LGBT+ youth organisation. It was great to get an idea of the range of support and services on offer for young people, particularly as these were youth-led. The remainder of the afternoon session was spent imagining scenarios using cards with given characters, situations and spaces to think about creating a story where a young person may be experiencing loneliness and to think of different ways in which they may be able to overcome this, or get help to overcome this. The aim of this session was to create a range of different practical and creative strategies for reducing youth loneliness to come up with potential ways to counter not only their current experience of loneliness, but also to suggest preventative measures. This way, these recommendations and actions can be taken forwards as part of the research to develop better services for young people. At the end of last month Amanda from the Co-operative College went along to the summit of a Co-op Foundation funded youth research project led by Manchester Metropolitan University and 42nd Street. The project had carried out an extensive exploration of youth loneliness and isolation, working through peer-to-peer participatory methods with youth co-researchers in many different communities around the UK. The day kicked off with an introduction to the project, emphasising that loneliness is an issue that can quickly escalate and take over other parts of our lives – an issue that is particularly acute for young people who may be experiencing these challenging feelings for the first time, and may not have developed the ability to see beyond their immediate situation. When introducing the research report, the MMU team talked about the problem of framing youth loneliness as something that is ‘wrong with kids’ or blaming social media, when it’s all about connecting with other people and re-thinking how we do this. This is why the project emphasised the importance of including young people’s voices and taking practical action to gain new insight. The key to thinking about loneliness is that this means something different to everyone, as everyone experiences loneliness differently. In addition, it’s an awkward subject to talk about, as it’s just not cool to be lonely. Therefore, the project team had to approach the topic ‘by stealth’ and find ways to talk about loneliness without naming and shaming, and creating a convivial and supportive space for people to open up about their experiences. How Can Co-Ops Continue Being A Force For Good? The Solidarity Co-op Summit was an ideal opportunity to put the SUSY project hat on and network with a group of other co-operators from around the UK at the Solidarity Co-op Summit. The main aim of the day was to talk about the shared needs of the movement and the social role of co-ops, described as ‘enterprise for the common good’ as opposed to enterprise for private benefit. Solidarity co-ops may be a relatively new term, but the idea harks back to the original Rochdale Pioneers who were absolutely challenging the system to engender social change and creating the sense that ‘we are building something together’. Some participants felt that there remained a need to reinvigorate the co-operative brand in the wake of the crises in the traditional co-operative movement and the potential loss of public support for co-operation. It was agreed that we need to collectively challenge this by reaching out with positive messages demonstrating the co-operative alternatives and showcasing how great they are. One way to empower smaller co-operatives is through horizontal networking, giving them a greater voice and helping co-operation between co-ops (Principle 6) to flourish. One key issue that came up was that historically, mutuality grows when times are tough, and it is estimated that in 2018 there will be more self-employed workers that public sector workers, many of whom will be underemployed, over-qualified and working precariously. This demonstrates a massive need for new co-ops to support a range of different areas, such as childcare and freelancers, and also for encouraging the movement to mobilise its assets to better support this need. People agreed that it is important to position solidarity co-ops at the forefront of the movement and to make this summit the start of a working group who will create a Solidarity Co-op Network. Green light for Zambia Project! Working with the Scottish Government’s international development department, this ‘Making Agriculture a Business’ project will support some of the poorest and most marginalised groups in the Central Province. The Co-operative College will utilise its co-operative expertise from its work in Malawi to empower women and people living with disabilities. Its training will equip local people with the knowledge they need to develop sustainable co-operative businesses. Farmers will also benefit from the partnership, with support given to diversify crops, sell more produce and engage with government. © 2019 Ankara Kalkınma Ajansı · Tüm hakları saklıdır.